THERE HAS BEEN some discussion lately about the priority farm organizations are putting on the messaging regarding the future of business risk management (BRM) programs. Due to the order of the Growing Forward 2 negotiations at the federal, provincial and territorial agricultural ministers’ meetings, the focus has been on BRM programming. This, coupled with the Ontario government’s announcement of the cap on the Risk Management Program and a need to make design changes to work within the cap, has heightened the urgency for BRM discussions to be resolved in the short term – especially since there is cross-compliance between AgriStability and RMP. But the discussion will turn to the non-BRM programs like research and market development this September. 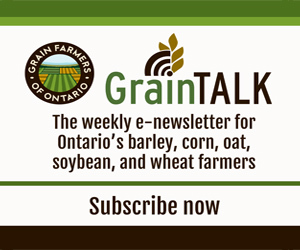 Grain Farmers of Ontario sees the continuation of both non-BRM and BRM programs at current funding levels as essential to the future of agriculture. Funding for these programs is not an either/or scenario, but equally necessary for increased innovation at the farm level. In research, our members have benefited from the Farm Innovation Program (FIP) that prioritizes on-farm research projects. Examples of high value research results from FIP include the development of the Ontario corn replant decision calculator, the creation of an online herbicide selector based on weed management studies, and the exposure of changes in wheat variety rankings when a fungicide is applied to wheat performance trials. Another federal research program under the first phase of Growing Forward is the Developing Innovative Agri-Products (DIAP) program. Grain Farmers of Ontario partnered with provincial grower organizations from Manitoba, Quebec and the Maritimes, SeCan and PepsiCo (Quaker) to attract $4 million in program funding to advance the development of field crop genetics for eastern Canada. A total of eighteen projects located at universities and research stations in eastern Canada are focusing on important priorities such as disease and Fusarium resistance, crop quality and value-added traits, agronomics and the development of molecular tools all with the overall objective of leading to superior varieties released on the market. None of the research initiatives under the FIP and DIAP programs are finite projects that will be completed by the end of the first phase of Growing Forward this year. The research in many cases is just starting to produce real results with varieties becoming available to farmers – it is imperative that there is enough funding available for these projects to continue into the next phase of the policy framework. Funding for programs like the Environmental Farm Plan that provide money for innovations right at the farm level are also essential in the next phase of Growing Forward. Ideally, funding for these environmental initiatives will increase because the programs are oversubscribed every year and funding runs out almost immediately after it is announced. In market development, a number of recent trade initiatives including missions to Asia and the European Union have been funded through Growing Forward. With continued focus on these areas in the next phase of agricultural policy, new trade opportunities will certainly result for Ontario’s grain farmers. It is important that funding to this area remain consistent to ensure our government is investing in future growth opportunities for Canadian farmers.